Michigan Wolverines fans, look no further for the ultimate arm chair player's throne! Imperial is proud to present its premium, officially licensed Michigan Wolverines Big Daddy Recliner, made especially for the Big and Tall Fan. Custom manufactured for you, near the furniture capital of the world, High Point, North Carolina. 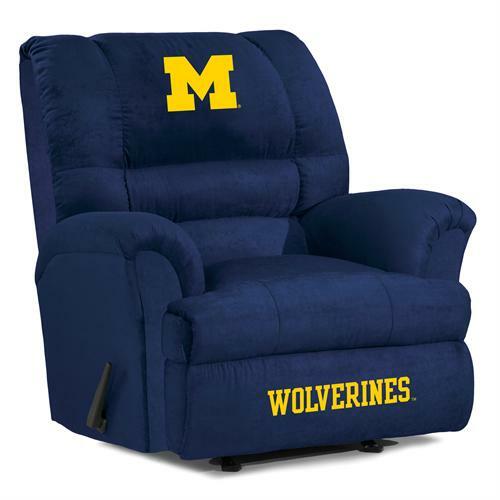 Enjoy this luxurious recliner featuring your favorite team's colors. Embroidered team logo patches are located on the headrest as well as the footrest. Your Big Daddy is sure to bring the home field advantage to your favorite room in the house! Dimensions: 42"L x 36"W x 46"H; Weight: 130 lbs.